I’m often annoyed at indecision, especially with leaders who flip flop without reason or vision, but even more so when it’s my own. Life decisions, whether regarding work, love, or what’s for dinner, should slice through the information overload of today’s world like a warm knife through butter, and rest comfortably on quite simply what makes sense to the ultimate objective. When we set out to write this particular recipe, it was both entertaining with how many variations we could make, but equally elucidating with a focus on balancing the right combination to bring a spotlight to the secret ingredient. 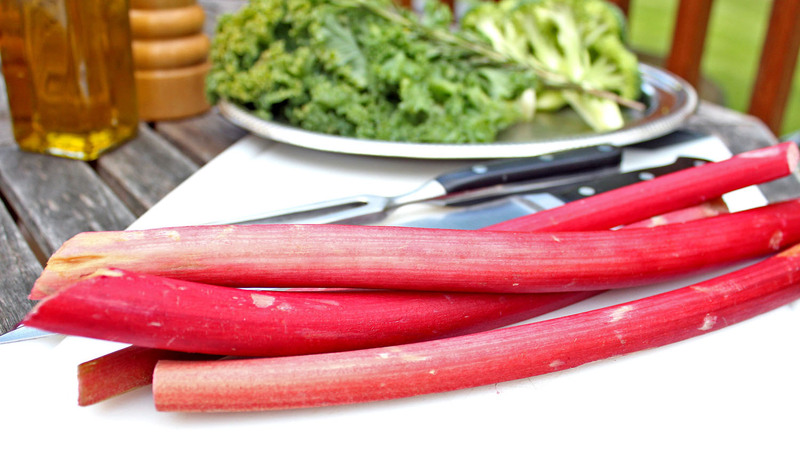 Rhubarb is one of the first harvests of spring in New England, and a real treat with an abundance of variable uses. The chutney in this recipe layered the tartness of the rhubarb with the balsamic vinegar and sweet agave nectar. 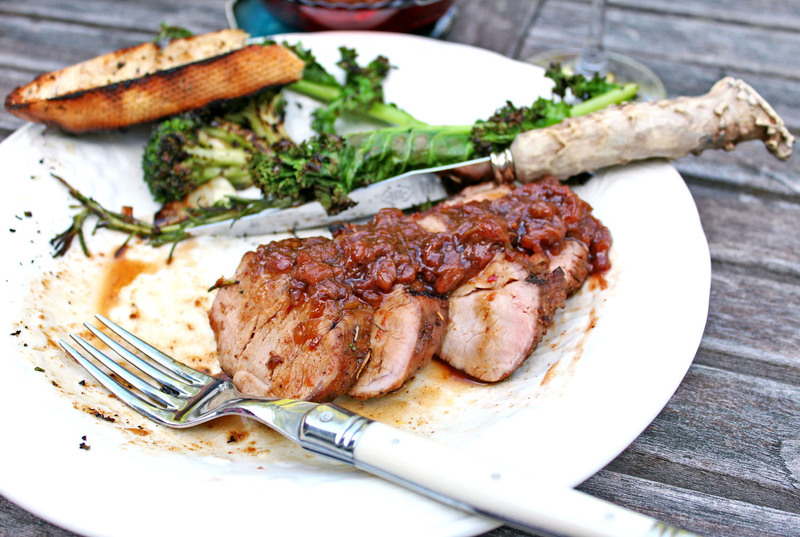 Slow grilling the spicy pork tenderloin on indirect heat also created a succulent accompaniment and was equivalently pleasing. Clarity is one of those life attributes that helps deliver real meaning, especially in cooking, and on this day made a very nice meal. Preheat grill with half indirect heat. 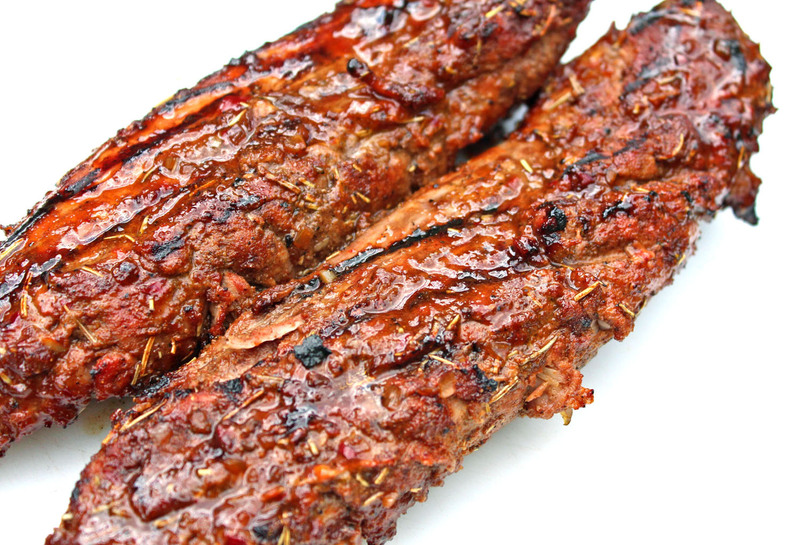 Remove from heat and let rest for 10 minutes before slicing. In a sauce pan over medium high heat, sauté onion and garlic with olive oil 2 minutes. Then brown sugar and run and cook for 2 minutes. Then add stock, hot sauce, and cinnamon stick. Bring to boil, then reduce to medium and simmer for 25 minutes until glaze thickens and is reduce by half. Remove from heat and remove cinnamon stick. Season with salt and fresh pepper, and set aside and let rest for 10 minutes. In a sauce pan, sauté red onions and rhubarb for 2 minutes. Add remaining ingredients and stir together. Then season with salt and pepper. Bring to a boil, then reduce heat to low, and simmer uncovered for 30 minutes or until rhubarb is tender. Serve warm. 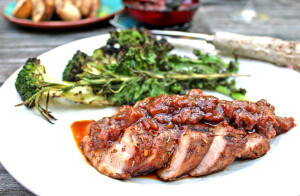 This entry was posted in Cooking, Main Dishes, Spring and tagged Grilled, Pork, Vegetables by cfaust. Bookmark the permalink.